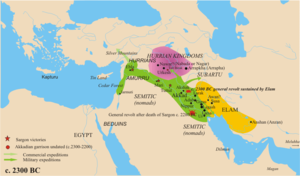 The approximate aurie o Hurrian settlement in the Middle Bronze Age is shawn in purpie. The Hurrians (/ˈhʊəriənz/; cuneiform: 𒄷𒌨𒊑; transleeteration: Ḫu-ur-ri), an aa cried Hari, Khurrites, Hourri, Churri, Hurri or Hurriter, war a fowk o the Bronze Age Near East. This page wis last eeditit on 3 Apryle 2017, at 02:52.